I took my kids on their first-ever backpacking trip this weekend (June 21-23) - we spent two nights in the White Mountains along the West Fork of the Little Colorado River, climbing Mount Baldy on the day in between. This was my first trip to the area. Despite the fact that Mount Baldy may have the least-impressive visual profile of any big mountain I've ever seen, I was really taken with the scenery and lush forest. Birds were outstanding too, although I didn't spend time doing dedicated birding. - American Dipper - a total of 5 individuals, spaced regularly along the creek. 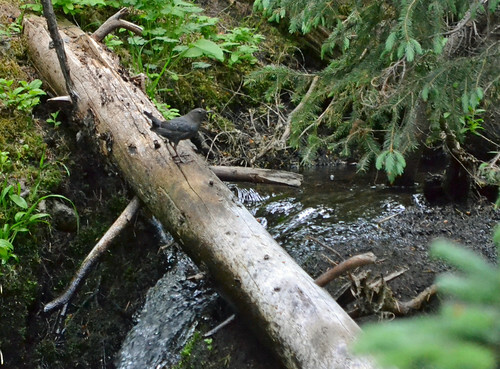 With all due respect to Picture Canyon, it was great to see an AZ dipper NOT bathing in wastewater effluent! - Golden-crowned Kinglets - innumerable! 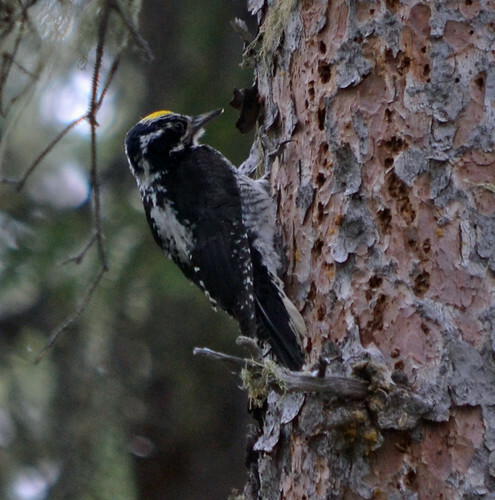 Either one loud bird followed me all weekend, or GCKIs are super-abundant and vocal on the slopes of Mount Baldy. - Gray Jay - I thought these would be a slam dunk, but these birds made me wait until about 1/4 mile from the trailhead on the way OUT before I finally saw them - a pair of birds (state bird - woohoo!). - White-crowned Sparrow - I saw a pair of birds together very high on Mount Baldy of the dark-lored "oriantha" subspecies. The 1981 version of Monson & Phillips indicates uncertainty about the breeding status of WCSP in the White Mountains. Is there any more recent data (I don't have the AZ breeding atlas on me)? Despite being on the lookout, I didn't see any Pine Grosbeaks (a rare breeder in the White Mountains), of which there were several reports a few years ago along this route. I guess I'll have to go back! Chuck points out to me that its good to be clear that the actual summit of Mount Baldy is on the White Mountain Apache lands, and is closed to hikers (and birders). The boundary of the National Forest is fairly well marked up there, and also on the USGS topo maps of the peak, and we stuck to the National Forest lands very carefully. I encourage anyone who heads up there to be respectful of the boundaries, and to err on the side of caution if in doubt. Current time: 18 Apr 2019, 7:38 PM Powered By MyBB, © 2002-2019 MyBB Group. Theme created by Justin S.